When hearing the word “Island” I imagine you, like I, visualise a remote and warming place of beauty and tranquillity… Well fittingly so as the contemporary indie band’s debut album Feels Like Air, released earlier this month, transports your mind to a stunning state of serenity, to which you will happily surrender to. The album delivers feelings of purity, bliss and effortlessness. It’s as if the magicalness of the music came oh so naturally to the talented foursome. However, I know that not to be so true as in reality, the album has taken a good year or so to be formed into what I would describe as a remarkably compelling piece of art. The opening track to the album; Ride, was released as a single in January 2018. 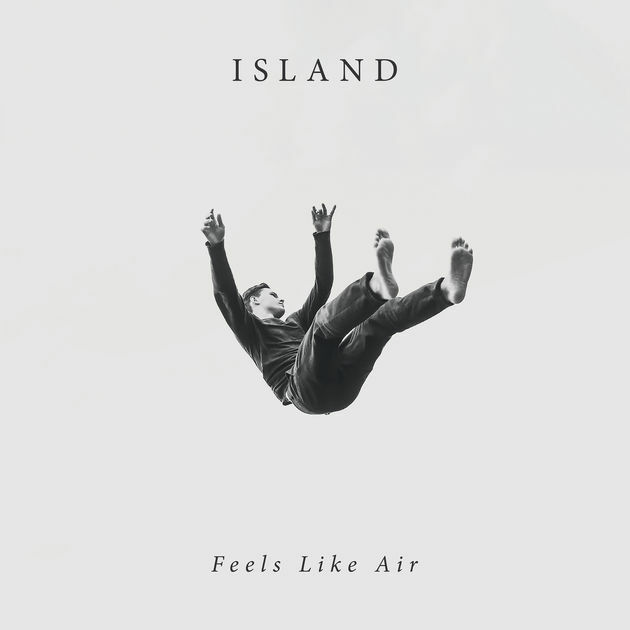 Once again, Island have succeeded when it comes to displaying a powerful melodic backdrop, with a striking bassline from James Wolfe and an on-going eloquent drum beat from Toby Richards. Lead guitarist, Jack Raeder, plays an equally as important role, delivering strong, sanguine spirits throughout, which works exceptionally well alongside lead singer, Rollo Doherty’s, wonderfully seductive and husky vocals. The track itself, tells a tale of how being on the road can bring undue stresses on an unspecified relationship, whether that be with a partner and/or music itself, the emotions conveyed in Doherty’s voice just makes the song all the more desirable. The lyrical side of the tune makes perfect sense given the incredible amount of touring the band have done over the past year. Try is the second song on the album and as I listen on, I notice a subtle theme throughout the next few songs. Much like Ride, the overall guitar symphonies convey upbeat emotions. Once Doherty’s soothing vocals start, a gradual build-up of bass and drums play softly, in keeping with the soft and smooth theme. Before taking it up a gear, releasing a more accomplished symphonic background. I read heartbreak in the lyrics though, expressed in a beautifully romantic, yet, tragically sad way. The Day I Die delivers such breathtaking and mesmerizing musical tunes, but also an emotive story, well that makes the album all the more impressive in my opinion. The opening lyrics; “Tell my baby I’ve got to go, no I won’t say goodbye. Straight to heaven or hell, I don’t mind, it’s all paradise” could be seen to relate to the last line of the lyrics in Try. As I listen on to the rest of the album, I still perceive an ambience that correlates exquisitely throughout. Not necessarily on the relationship front but turning to hopes, prays, dreams and just an overall message of spiritualness. To me, every song on the album, tells a story and when combining the tracks together, it shares the story of a dream that four friends have shared, to get to a place where they can make music, tour together and release an album and what they went through to get there. All the tracks on this album are nothing short of delightful but some make more of an impression. The title track Feels Like Air is probably my favourite track on the album. It oozes such an irresistibly romantic ambience. I remember hearing this song live before knowing its title and in all honesty, it instantly became my favourite Island song. The drums, bass and guitar all work together perfectly to present a soothingly passionate euphony and with Doherty’s amorous voice delivering such affection and sensual lyrics, this song, in my opinion, is a sensational masterpiece. The last track of the album Lilyflower feels slightly different to me, with what sounds like a stripped back, relaxed ongoing guitar melody. It’s the most gentle track on the album. Again, Doherty’s recognisable dreamy vocal works admirably alongside this song. Island manage to have an incredibly distinctive sound whilst remaining fresh with each new release. If album two is anything compared to Feels Like Air, it simply can’t arrive soon enough.